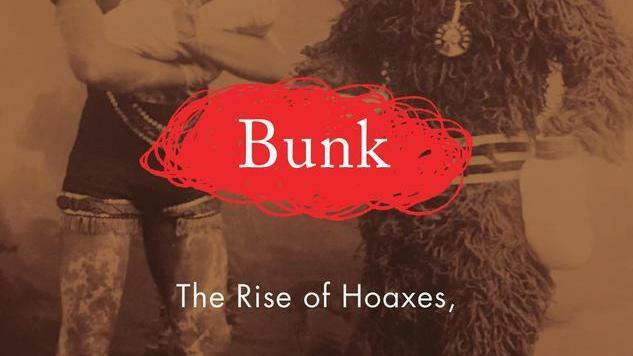 Kevin Young’s Bunk: The Rise of Hoaxes, Humbug, Plagiarists, Phonies, Post-Facts, and Fake News proves a thorough history of the titular cons. While Bunk stretches from Barnum to Trump and touches on most every flavor of falsehood in between, Young’s x-ray vision finds the true through-lines which bind them all together: an exploitation of grief, pride and race. The book’s surprisingly doleful turn feels almost like a hoax itself, albeit a fantastic and important one; a reader may dive in expecting lighthearted fair (at least until Trump) and is struck instead by each hoax’s true evil. Below are five examples of hoaxes Young examines, which speak to the place of pain and race in our deceit. A six-part series of articles eventually revealed to be the work of Sun editor and reporter Richard Adams Locke, the “Great Moon Hoax” claimed that astronomer Sir John Herschel had discovered had discovered a civilization on the Moon. This society featured fantastic creatures and two races of Moon-men—including the monstrous Man-Bats, which Young says are a stand-in for black people. Coming a year after the anti-abolition riots, Locke’s complex hoax is tough to pin down as either anti-slavery satire or racist fever-dream. What does seem clear, Young writes, is the striation of the Moon civilization’s resonance with terrestrial readers. Merely one of the most famous and skin-crawling of the 19th century’s racial sideshows, P.T. Barnum’s exhibition of a black man as the “missing link” in Darwin’s recently released Origin of Species was so famous as to be seen by the Prince of Wales. “It” was in reality William Henry Johnson, who, Young points out, looked very much like an ordinary man. Johnson’s unflattering haircut, meant to exaggerate and create the illusion of a pointed head, has lived on to today. Re-named Zip, Johnson—who would have a long, successful career as a sideshow—would eventually lend his image to less racially-charged characters like Zippy the Pinhead and the Coneheads of Saturday Night Live. In a truly lucrative hoax, journalist Clifford Irving took advantage of Howard Hughes’ social silence in an attempt to bilk his publisher, McGraw-Hill, out of hundreds of thousands of dollars. With forged hand-written notes from Hughes and the doubt created by the famed magnate’s isolation, Irving’s scheme was eventually undone through a bizarre series of events featuring a cast of characters—including a Swiss artist’s wife and a Danish singer mistress—seemingly from a movie (which it would, in fact, become in 2005 with Richard Gere starring as Irving). Of all the fabricating journalists Young covers, perhaps none sting worse than Jayson Blair. It was not merely the extent of Blair’s lies—which included claiming filing stories from various locations while sitting at home in New York, plagiarizing other’s articles and using photographs to lift identification details—which shock, but the content of the articles he lied about. Lying while covering such tragic events as the Beltway snipers and bereaved families who had lost loved ones in the Iraq War, Blair is an obvious and modern example of the hoaxer’s availing to grief. Another modern incarnation of an old trick, Rachel Dolezal’s claims of blackness echo such famous fakers as faux-Native Americans Grey Owl—a supposed half-white, half-First Nations author and activist née the white, wealthy and British Archibald Belaney—and Tim Barrus, who wrote as the Navajo Nasdiji. Dolezal’s appropriation took an interesting turn when she attempted to claim race as her identity, auguring important concerns of self-identification and agency at the forefront of societal conversation into the ground. As a teacher of African Studies and head of the Spokane branch of the NAACP before being exposed as white, Dolezal and her story are both centuries old and distinctly modern.